Just as oil prices hit multiyear lows, several oil majors announced some more terrible news. The Kashagan oil field – the world’s most expensive oil project – will face several more years of delays and cost overruns. The project’s price tag, already north of $50 billion (other estimates say costs are much higher), will rise by an additional $4 billion as a consortium of international oil companies have to replace two 55-mile pipelines. The episode highlights the growing difficulty that oil majors are having at maintaining their worldwide production levels. Kashagan was supposed to be a symbol of Kazakhstan’s arrival. Situated offshore in the Caspian Sea, the oil field holds an estimated 13 billion barrels of oil, enough oil to meet total global demand for five months. In fact, when it was discovered in 2000, it was arguably the largest oil discovery in three decades. But accessing the oil is another matter. The project also claims the title of the world’s most technically challenging oil project, due to several unique challenges. First, the Caspian ices over for part of the year, which makes drilling difficult. Second, the oil is located several kilometers below the seabed where it comingles with large volumes of toxic hydrogen sulfide. 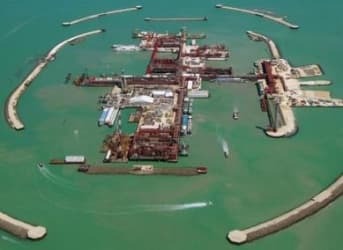 The North Caspian Operating Company (NCOC), the international consortium heading up the project, has struggled mightily with Kashagan. It was originally supposed to be operational in 2005 and only cost $10 billion, but technical challenges delayed the project for the better part of a decade. Kashagan briefly came online in the fall of 2013, but was quickly shut down because of corrosion in its pipelines, and it has been idled since then. The problem is the harsh and corrosive nature of hydrogen sulfide gas, or H2S. Two 55-mile pipelines have to be totally replaced because sulfide gas has corroded them. After NCOC decided the pipelines would need to be replaced in their entirety, they announced that the project would be delayed until at least 2016. But the Financial Times reported on October 9 2014 that the consortium – led by Royal Dutch Shell, ExxonMobil, Total, Eni, and CNPC – has decided to use a more corrosive-resistant metal for the pipelines. That should help it avoid future problems with H2S, but it also carries a heavy price tag. The replacement could cost at least $3.6 billion, perhaps more. “You can safely bet it’s going to be more than [$3.6bn],” a source told the FT. And now, production may not begin until 2017 at the earliest. Kashagan continues to be a severe headache for all the companies involved. But it couldn’t come at a worse time, with oil prices falling below $90 per barrel. And that underscores the dangerous territory that oil majors are operating in. Once Kashagan comes online, it will provide a benchmark for where the oil industry is going. As Josh Young writes for Seeking Alpha, Kashagan represents a dramatic rise in the marginal cost of production for a barrel of oil. The exact costs per barrel are unknown – especially since no oil has begun flowing yet – but we do know that the project will produce some of the most expensive oil in the world. And that is the problem for oil majors trying to replace aging and mature fields where production is declining. Old fields with lower marginal costs are being replaced with new expensive oil – whether it is from shale, offshore, or in the Arctic. When averaged across the industry, it becomes clear that the cost to produce a barrel of oil is rising and will probably continue to rise. Over the past five years, the top three international oil companies spent a combined half-trillion dollars to develop new fields, but for many of the top companies, production has either stagnated or is slightly declining. That does not bode well for shareholders over the long-term, particularly if oil prices do not rebound. On the other hand, oil prices cannot stay as low as they are right now if the marginal cost continues to rise. At some point oil prices will force production offline and tighter supplies will bring prices back up. The key point is that the specific threshold for whether or not to bring an additional barrel of oil to market – the marginal cost of production – is rising. In other words, oil prices will always fluctuate, but the floor price for oil over the long-term will only go up. And you only need to look at the mess with the Kashagan field to realize why that is the case.